Economists traditionally divide international trade into two large categories: (1) merchandise trade, the trade of tangible products, goods, or articles originating from the primary (agriculture, forestry, fishing, mining and quarrying) and secondary (manufacturing) sectors of the economy; and (2) services trade, also referred to as “invisible trade,” the trade of shipping, financial, insurance, and other services originating from the tertiary (services) sector of the economy. To get a full picture of a nation’s balance of international trade, both merchandise and services trade need to be reckoned with. The balance of payments methodology assigns prominent roles both to merchandise trade and to services trade in the computation of the current account and other balance of payments aggregates. The subtitle of this paper raises two points regarding the “visibility” of Cuban foreign trade in recent years, which will be developed in the text. First, that consistent with the lack of transparency that is customary regarding Cuban statistics, the amount of information from Cuban sources documenting trade flows is meager and has actually been declining over time. Moreover, the methodology underlying the trade statistics is unclear in many respects and their interpretation raises numerous questions. And second, that Cuba’s foreign trade—and particularly Cuba’s export offerings— is increasingly dominated by exports of services, that is, by “invisible” exports. In what follows, the focus is on the period 2001–2006, a time span for which more-or-less consistent information is available from Cuban official sources; selected references to trade flows during other time periods are also included to provide context to recent trends. The first section describes data that are available from Cuban official sources and some of their limitations. The second section examines Cuba’s merchandise trade over the reference period, while the third does the same with respect to services trade. The fourth combines merchandise and services trade from the previous two sections to provide an overall picture of Cuba’s foreign trade. The paper closes with some general comments on patterns of Cuban foreign trade in the new century. Cuba’s statistical yearbook, Anuario Estadístico de Cuba, the principal source of official statistics from the island, has been published more or less annually since 1972 (there was a publication gap, for example, from 1990 to 1995).2 The most recent edition of the yearbook (for 2006), includes a section on the external sector with selected statistics on the balance of payments, foreign debt, and international trade.3 The ten tables on international trade all refer to merchandise trade: overall exports and imports, trade turnover and trade balance; overall trade turnover and exports and imports by major trading partner; exports and imports by major commodity groups; exports and imports by major category of the Standard International Trade Classification (SITC) of the United Nations; and selected exports and imports by SITC chapter and commodity. A major weakness of Cuban merchandise trade statistics is that although there are breakouts for major trading partners and for key commodities, there are no cross-tabulations that show commodity trade by trading partner. This information is essential for analysis of trade patterns. For example, as is discussed below, the United States is a key source of Cuba’s agricultural imports. This cannot be discerned from Cuban statistical data, however, which show separately that the United States has been an important Cuban supplier of goods and that Cuba has imported a range of agricultural commodities, but shows neither the commodity composition of U.S. exports to Cuba nor the significance of shipments from the U.S. within each traded agricultural commodity. The statistics on exports and imports by SITC chapter and commodity are the most detailed foreign trade statistics that Cuba currently produces. In many instances, both quantity (in tons, units, cubic meters, etc.) and value (in pesos) of exports or imports are provided, which allow for the calculation of unit values and crude analysis of whether changes in exports or imports of a commodity result from changes in quantity traded, price, or both. Interestingly, for certain key traded commodities, the level of detail provided by Cuban statistical sources has been declining over time. Cuba provides minimum information on services trade. In fact, the external sector section of the most current Anuario refers to services trade only once, and this is in a table on the current account of the balance of payments. To make things worse, such table does not even separate out services exports and imports, and instead reports only on the balance of services trade (i.e., services exports minus services imports). A more recent Cuban statistical source repeats the same level of information.5 As will be discussed below, the services trade statistics, particularly those dealing with exports of services, raise questions regarding the valuation of such exports. Finally, another problem that plagues Cuban foreign trade statistics (merchandise trade and services trade) is the currency in which the trade flows are reported. At least three currencies are relevant in this regard: (1) pesos, the official currency of the nation; (2) pesos convertibles (convertible pesos or CUC), a currency created in the early 1990s and used domestically to transact goods and services that are not available in the peso economy; and (3) U.S. dollars, whose use in the island was legalized in 1993 and banned in 2004 (Cuban citizens currently can hold dollars, but only CUC and pesos can be used in commercial transactions). The Cuban statistical yearbook reports trade data in pesos, but a methodological note states: “With regard to exports and imports, values are expressed in Cuban pesos, after conversion from foreign currency, in accord with existing rates of exchange and methods established by the Central Bank of Cuba.”6 Unfortunately, this note is not very helpful in clarifying which conversions have been made and which exchange rates have been used. It is likely that the statistics refer to Cuban pesos measured at par with U.S. dollars, as other statistical sources (see below) report the Cuban peso figures as U.S. dollars. Moreover, U.S. dollars is the reference currency used around the world for international trade statistics. 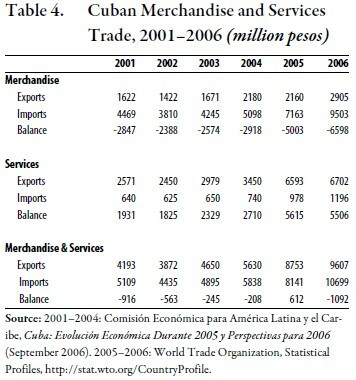 Table 1 presents official Cuban data on merchandise or goods exports, imports, and trade balance (value of exports minus value of imports) for the period 2001– 2007. It is clear from the data that Cuba’s merchandise trade was in deficit during every year of the reference period. Both merchandise exports and imports showed a generally positive trend, but the value of imports was consistently more than twice that of exports. In 2006, Cuba’s merchandise trade deficit peaked at nearly 6.7 billion pesos, a new record. Based on preliminary official data, the merchandise trade deficit in 2007 amounted to nearly 6.4 billion pesos. 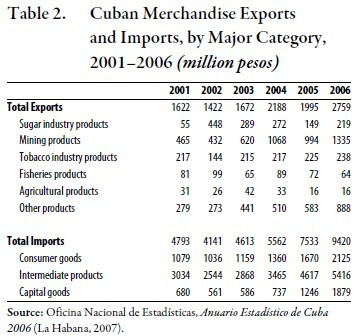 Table 2 presents major categories of Cuban merchandise exports and imports for the period 2001–2006. The specific products that are mapped into each of the major categories is not well defined. As will be discussed below, this gives rise to some problems in analyzing the information at the level of specific export and import products. Exports: With regard to major categories of merchandise exports (top part of Table 2), the relatively low— and declining—share of sugar industry exports is noteworthy. Such exports fell from 550 million pesos in 2001 to 149 million pesos in 2005, or by 73%, and rose to 219 million pesos in 2006. In the latter year, the most recent for which data are available, sugar industry products accounted for under 8% of Cuban merchandise exports, a remarkable drop from the 80–85% share they held during the second half of the 1980s (when the Soviet Union paid above-market prices for Cuban sugar), clearly showing the decline of Cuba’s flagship industry during the nineteenth and twentieth centuries. The decline of sugar exports is consistent with the demise of the island’s sugar industry orchestrated by the Cuban government. The industry was starved of investment and operating capital during the 1990s and subsequently dismantled under the guise of an industry “restructuring” plan ostensibly intended to increase efficiency. In mid-2002, the government announced the immediate shut down of 71 of the nation’s 156 sugar mills and the redeployment of an additional 14 to produce sugar derivatives; the shift of about 1.3 hectares of land (out of a total of about 2 million hectares devoted to sugar) to other uses; and the elimination of about 100,000 jobs. A second wave of sugar mill shut downs was launched in the fall of 2005 with the intention of taking out of production 40 to 50 additional mills, reducing sugar production to levels that would suffice to meet domestic demands plus a small surplus to meet export commitments,9 consistent with President Fidel Castro’s pronouncement in March 2005 that Cuba’s sugar era had ended and associating sugar production with the past evils of slavery and illiteracy. 10 Sugar production was approximately 1.3 million tons in 2005 and 1.2 million tons in 2006. For comparison purposes, recall that Cuban sugar production reached 8.3 million metric tons in 1984 and 7.3 million tons in 1953. The trend in mining industry exports is the mirror image of that of the sugar industry: exports tripled from 465 million pesos in 2001 to 1.4 billion pesos in 2006, with mining industry exports accounting for almost half (48%) of the value of merchandise exports in the latter year. Nickel led the increase in exports of the mining sector, with foreign investment and favorable commodity prices contributing to an expansion of exports. Toward the second half of the 1990s, nickel became Cuba’s main source of merchandise exports. Cuba’s nickel resources are the world’s third largest and its reserve base the second largest; in 2006, Cuba was the world’s eighth largest producer of mined nickel. 11 Like sugar, the nickel industry was also affected by the break-up in commercial relations with the socialist community, with nickel production declining by 42% between 1989 and 1994. In 1991, Canadian corporation Sherritt, Inc., began to purchase nickel and cobalt sulfides produced by a plant at Moa built in the 1940s by U.S. investors to supply the defense needs of that country during World War II; the exported Cuban nickel and cobalt sulfides were to be further refined at a refinery owned by Sherritt at Fort Saskatchewan, Alberta, Canada. In 1994, however, Sherritt and Cuba’s Compañía General del Níquel, the state-owned entity that manages the Cuban nickel industry, created a joint venture to develop and market Cuban nickel resources. Spearheaded by the Sherritt joint venture, the Cuban nickel industry recovered and performed well in the 1990s, with output steadily increasing.12 The nickel industry has also benefited from strong international demand, reflected in high world market prices, particularly over certain time periods. The future of the Cuban nickel industry appears bright, with projected strong world demand and prices influenced by China’s hunger for raw materials, and new investments in production capacity from Sherritt and from Venezuela and China. Exports of products of the tobacco, fisheries, and agricultural sectors were stagnant or lost market share during the period 2001–2006. The fisheries sector continued to struggle after a golden period in the 1970s when Cuba commanded a large international fleet operating in far-away fishing grounds. Agricultural exports were adversely affected by the overall negative performance of the sector. The “Other Products” category performed well, rising from 279 million pesos in 2001 to 888 million pesos in 2006 or by 219%. These non-traditional exports accounted for nearly a third (32%) of total exports in 2006, compared to less than one-fifth (17%) in 2001. Although the composition of this category is not well defined in Cuban statistics, the product categories that account for the bulk of the exports seem to be machinery and transport equipment (various categories amounting to 229 million pesos in 2006), pharmaceuticals (162 million pesos), scientific instruments and equipment (95 million pesos), iron and steel (43 million pesos), and cement (39 million pesos). As will be discussed below, the growth of exports in these nontraditional categories appears to be related to Cuban exports of services. Imports: Compared to the 1970s and 1980s, the share of capital goods within Cuba’s merchandise imports during the Special Period was very low. Throughout this period of economic upheaval, the nation’s limited import capacity was focused on consumer goods (primarily food) and intermediate products (primarily fuels), foregoing the acquisition of capital goods (machinery, transportation equipment) necessary to support future economic growth. This pattern has continued in recent years. According to statistics in the bottom panel of Table 2, in 2001, capital goods accounted only for 14% of imports, consumer goods for 23% and intermediate products for 63%. In 2006, the most recent year for which disaggregated trade statistics are available, capital goods imports rose to about 20% of imports, while consumer goods accounted for 23%, and intermediate products for about 57%. About 60–70% of Cuba’s imports of consumer goods during the period 2001–2006 were foodstuffs. Cuba imported not only significant volumes of cereals, such as wheat, which are not cultivated in the island because of climatic reasons, but also a range of other food products that are suitable for domestic production such as meat, rice, beans, milk, and so on, a reflection of the poor performance of the agricultural sector. Recall that Cuba instituted a rationing system for basic consumer goods (food, clothing and footwear, personal hygiene products) in 1961 and the system is still in place today, more than 45 years after it was enacted, as domestic production and imports have not matched local demand. The role of imports of food products from the United States is discussed in the section below. The growth in imports of intermediate products reflects in large part the rising trend in the value of imports of fuels. In 2001, fuels accounted for 32% of the value of intermediate products imports, while articles classified chiefly by material (textiles, rubber products, iron and steel, wood products, paper and cardboard, and so on) accounted for 22%, and chemicals for 16%. In 2006, despite preferential arrangements for oil imports from Venezuela (see below), fuels accounted for 42% of the value of intermediate products imports, articles classified chiefly by material for 19%, and chemicals for 12%. 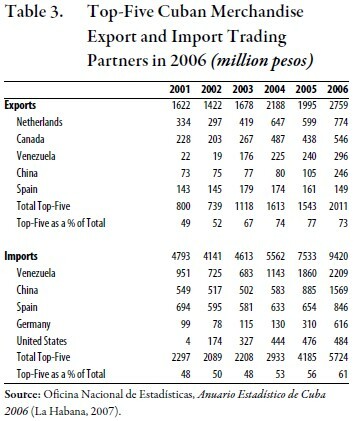 Table 3 shows Cuba’s main merchandise trading partners in 2006, differentiating between exports and imports. For the top-five merchandise trading partners in 2006, value of exports and imports are shown for each year during 2001–2006; also shown is the value of the top-five trading partners combined and the share they represent with respect to total merchandise exports and imports. In 2006, Cuba’s top-five merchandise export markets— Netherlands, Canada, Venezuela, China, and Germany, in that order—took nearly three-quarters (73%) of Cuba’s exports (top section of Table 3). Cuba’s two top merchandise export markets, the Netherlands and Canada, held these positions in large part because they are the primary outlets for Cuban mineral exports, predominantly nickel. Recall that a sizable portion of Cuba’s mineral nickel exports are destined for Canada for refining at a refinery jointly owned by Sherritt and Cuba’s Compañía General del Níquel and from there they are further distributed. More than half of Cuba’s nickel is marketed through a Dutch metals company based in Rotterdam, hence the very high value of Cuban exports to the Netherlands. It is also noteworthy that Venezuela and China have emerged as significant markets for Cuban merchandise exports, consistent with the strengthening of political relations between Cuba and these nations. From press reports and other fragmentary information, it appears that Cuban exports to Venezuela span a wide range of manufactured products and machinery—pharmaceuticals, cement, iron and steel, specialized machinery, and measuring equipment. The growth of these merchandise exports most likely is connected to Cuban technical assistance and the presence of Cuban personnel in Venezuela who procure materials and equipment from the island to conduct tasks there. The role of Venezuela as Cuba’s privileged oil supplier was formalized in a cooperation agreement (Acuerdo Integral de Cooperación) signed in October 2000 by Presidents Castro and Chávez whereby Venezuela committed to supply Cuba with 53,000 barrels per day (b/d) of oil and oil products under favorable financing terms in exchange for Cuban technical support and assistance in the areas of education, public health, sports, and scientific research. In December 2004, the two sides revised the agreement and increased the guaranteed oil supply level under concessional terms to 90,000 b/d. There is evidence that Cuba has fallen behind in repaying Venezuela for oil shipments and that Venezuela has been less than energetic in demanding repayment. Cuba’s rapidly growing merchandise imports from China—such imports nearly tripled from 549 million pesos in 2001 to nearly 1.6 billion pesos in 2006— have been financed by a series of credits extended to Cuba to purchase Chinese goods. In December 2004, Cuba announced several Chinese grants and credits, among them: (1) a donation of $6.1 million to purchase fabric for the manufacture of school uniforms; (2) a credit of $6.1 million to purchase supplies for hospitals and policlinics and spare parts for medical equipment; and (3) a credit to finance imports of 1 million TV sets.14 Among the principal Cuban imports from China supported by such credits are electro- domestic appliances (particularly rice cookers, refrigerators), electronic products (particularly television receivers), and transportation equipment (particularly buses for local and inter-provincial transportation). 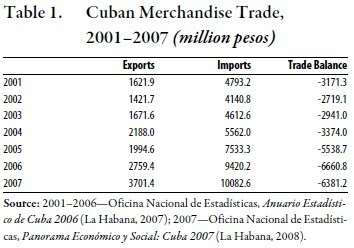 One final observation on Table 3 is the presence of the United States—a country that maintains a trade embargo on the island—among Cuba’s top-five merchandise importers in 2006.15 Over the period 2001–2006, Cuban merchandise imports from the United States rose from 4 million pesos to 484 million pesos, or by 12,000%. The anomalous situation of rapid trade growth in the face of an economic embargo arises from the enactment by the United States in 2000 of the Trade Sanctions Reform and Export Enhancement Act (TSRA), which modified the extant trade embargo to allow direct exports to Cuba of food provided such exports were paid for in cash. Initially, the Cuban government rejected the U.S. initiative because it wanted (1) the full removal of the embargo; and (2) to be able to purchase U.S. food products on credit. In 2001, however, Cuban authorities did an about-face and agreed to purchase U.S. agricultural commodities complying with the payment provisions of the TSRA. According to U.S. Department of Agriculture statistics, U.S. exports of agricultural commodities to Cuba amounted to $4 million in 2001, $140 million in 2002, $248 million in 2003, $384 million in 2004, $346 million in 2005, $321 million in 2006, and a record $432 million in 2007. In 2006, the United States was Cuba’s 5th largest source of merchandise imports and Cuba was the 33rd largest market for U.S. agricultural products. As noted above, information on services trade published by Cuban official statistical sources is extremely sparse. Balance of trade statistics published for recent years report only net services trade, and do not provide statistics even on the value of exports and imports of services separately. However, presumably based on data made available by the Cuban government, the Comisión Económica para América Latina y el Caribe (ECLAC) has published statistics on Cuba’s services exports and imports for 2001–2004.16 Cuba has also provided some statistics on commercial services exports and imports to the World Trade Organization (WTO) that have been published by the WTO in its country trade profiles.17 Statistics from these two sources are reported in Table 4. According to data in Table 4, Cuba ran a surplus in its balance of international trade in services in every year over the period 2001–2006. The size of the services trade surplus grew by nearly three-fold over the period, from 1.9 billion pesos in 2001 to over 5.5 billion pesos in 2006. As will be discussed in the next section, the surpluses in services trade go a long way toward offsetting the large merchandise trade deficits incurred by Cuba and discussed in the previous section. Transportation services: In the 1970s and 1980s, Cuba made significant investments to expand its international shipping fleet under the protective umbrella of intra-COMECON trade. In the early 1990s, in the midst of an economic crisis and facing an international trade collapse, the volume of cargos transported on Cuban bottoms decreased significantly and the international shipping fleet and the maritime transportation industry more broadly were scaled back significantly; 18 in the mid-1990s, the maritime shipping sector some foreign investment flowed into the maritime shipping sector in the form of joint ventures to provide port services and warehousing. Statistics on the volume of maritime services exports are not available, but they probably are not large and certainly they could not account for the rapid of growth of Cuban services exports in recent years shown in Table 4. Tourism: The tourism industry has been one of the bright spots of Cuban economic performance since the 1990s. After shunning tourism for over two decades, Cuba began to promote the industry in the mid- 1980s and stepped up efforts in the 1990s, principally by encouraging joint ventures with foreign hospitality companies. By the second half of the 1990s, tourism was the nation’s main generator of foreign exchange. Gross revenue from tourism amounted to 1.5 to 2.0 billion pesos per annum in 2001–2003 and reached 2.4 billion pesos in 2006. Based on fragmentary information, it seems likely that tourism was responsible for the bulk of Cuba’s exports of services until the recent take-off of professional services exports (see below). According to figures that Cuba provided to the WTO, exports of tourism services accounted for the following shares of Cuba’s total services exports: 2003, 63%; 2004, 51%; 2005, 32%; and 2006, 31%. Professional services exports: Cuba’s heavy investments in public health and education over the last five decades created an environment within which Cuba could benefit from the export of professional services in health, education, sports, and science. Internationalism in the fields of public health and education, among others, was a tool that Cuba used in its diplomatic endeavors in the 1970s, 1980s, and 1990s. However, until recently, Cuban internationalist experts were provided free or nearly-free of charge and their services were considered as a form of foreign aid. The large jump in the value of Cuban services exports in Table 4 corresponds to the time period when Cuban experts have been providing health and other services in Venezuela. This raises the issue of how Cuban professional services performed in Venezuela and in other countries might have been priced. There is evidence that, for purposes of computing its national accounts, Cuba has begun to value medical and social services in a manner that is not consistent with international national income accounting methodology.21 This methodological change adopted by Cuba results in faster growth rates than otherwise. More detailed information from the Cuban government or from trading partners would be necessary to ascertain the methodology underlying the pricing of Cuban health, education, and other exported services to Venezuela and other countries. The bottom rows of Table 4 combine merchandise and services trade to show Cuba’s overall trade balance, i.e., balance of both merchandise and services trade. With the exception of 2005, Cuban balance of merchandise and services was in deficit, meaning that Cuba was a net importer of resources from abroad. To be sure, the large surpluses in services trade—particularly in 2005 and 2006—went a long way toward offsetting chronic merchandise trade deficits, but were not sufficiently large to offset them totally. In conclusion, Cuban foreign trade in the period 2001–2006 was unbalanced, with Cuba needing to rely on other sources of resources from abroad in order to bring its overall international payments into balance. The structure, product composition, and partners of Cuban foreign trade have changed significantly in recent years. Merchandise trade has been eclipsed by very fast-growing services trade. Within merchandise trade, there has been a rearrangement of key export and import commodities, with sugar relinquishing its longstanding leading role within exports. Finally, the composition of trade by partners has also changed significantly, with a new set of trading partners coming to the fore. Cuban foreign trade statistics are sparse and subject to frequent changes and adjustments. Cuba publishes statistics on merchandise trade at an aggregate level. At times, details on certain critical sectors (e.g., on fuels) are suppressed. Cuba does not publish cross-tabulations of commodity by country, which limit the depth of the analysis that can be conducted. On services trade, Cuban statistical sources essentially do not publish anything other than net services trade. Other organizations to which Cuba belongs are able to obtain additional information, which has been used in this paper, but is far from the data that would be required to conduct a serious analysis of the services trade sector. The data reviewed in this paper suggest that Cuba continues to run a significant deficit in its merchandise trade balance, and that the magnitude of the deficit has been rising in recent years. With regard to services trade, however, the fragmentary data in Table 4 suggest that Cuba has run substantial trade surpluses, which expanded strongly in 2005 and 2006, most likely as a result of booming exports of services to Venezuela and other nations. There are many questions about the composition and valuation of these exports of services which cannot be addressed until underlying data are released by Cuba or by the partner countries. With the exception of 2005, Cuba has run deficits in its overall trade balance of merchandise and services during the period 2001–2006. 1. This paper draws from Pérez-López, “Tiempo de cambios: Tendencias del comercio exterior cubano,” Nueva Sociedad, 216 (Julio-Agosto 2008). 2. The first editions of the Anuario were published under the responsibility of the Central Planning Board (Junta Central de Planificación, JUCEPLAN). Beginning in 1975, they were published under the responsibility of the State Committee on Statistics (Comité Estatal de Estadísticas, CEE) and since 1996 of the National Statistical Office (Oficina Nacional de Estadísticas, ONE). Prior to 1972, other national statistical publications were available, Boletín Estadístico de Cuba and Compendio Estadístico de Cuba, both published by JUCEPLAN. Since 2004, ONE has posted the Anuario and other statistical publications in its website, www.one.cu. 3. Oficina Nacional de Estadísticas, Anuario Estadístico de Cuba 2006 (La Habana: ONE, 2007). 4. This not to say that the statistics available earlier were capable of supporting in-depth analysis. For example, efforts by this author to examine Cuban-Soviet terms of trade regarding sugar and oil and to estimate subsidies in Cuban-Soviet sugar trade had to rely on Soviet trade statistics, as Cuban data were neither sufficiently disaggregated nor consistent to be able to be used. See Pérez-López, “Sugar and Petroleum in Cuban-Soviet Terms of Trade,” in Carmelo Mesa-Lago, editor, Cuba in the World (Pittsburgh: University of Pittsburgh Press, 1979) and “Subsidies in Cuban-Soviet Sugar Trade,” Chapter 8 in Pérez-López, The Economics of Cuban Sugar (Pittsburgh: University of Pittsburgh Press, 1991). 5. Oficina Nacional de Estadísticas, Panorama Económico y Social: Cuba 2007 (La Habana: ONE, 2008). 6. The note reads: “Tanto en las exportaciones como en las importaciones, los valores están expresados en pesos cubanos, una vez efectuada la conversión de la moneda extranjera, de acuerdo con las tasas de cambio y métodos vigentes, establecidos por el Banco Central de Cuba.” See www.one.cu. Table 1. Cuban Merchandise Trade, 2001–2007 (million pesos) Exports Imports Trade Balance 2001 1621.9 4793.2 -3171.3 2002 1421.7 4140.8 -2719.1 2003 1671.6 4612.6 -2941.0 2004 2188.0 5562.0 -3374.0 2005 1994.6 7533.3 -5538.7 2006 2759.4 9420.2 -6660.8 2007 3701.4 10082.6 -6381.2 Source: 2001–2006—Oficina Nacional de Estadísticas, Anuario Estadístico de Cuba 2006 (La Habana, 2007); 2007—Oficina Nacional de Estadísticas, Panorama Económico y Social: Cuba 2007 (La Habana, 2008). 7. For a discussion of Cuban merchandise trade during this period see, e.g., Pérez-López, “Cuba’s Foreign Economic Relationships,” in Georges Fauriol and Eva Loser, editors, Cuba: The International Dimension (New Brunswick: Transaction Publishers, 1990) and “El sector externo de la economía,” in Efrén Córdova, editor, 40 años de revolución: El legado de Castro (Miami: Ediciones Universal, 1999). 8. Cuba’s international trade relations during the Special Period are discussed, e.g., in Pérez-López, “Swimming Against the Tide: Implications for Cuba of Soviet and Eastern European Reforms in Foreign Relations,” Journal of Inter-American Studies and World Affairs (Summer 1991); “The Cuban Economic Crisis of the 1990s and the External Sector,” Cuba in Transition—Volume 8 (Washington: Association for the Study of the Cuban Economy, 1998); “The Cuban External Sector in the 1990s,” in Victor Bulmer-Thomas and James Dunkerley, editors, The United States and Latin America: The New Agenda (London: Institute of Latin American Studies, University of London, 1999); and “El sector externo de la economía socialista cubana,” in Mauricio de Miranda Parrondo, editor, Cuba: Restructuración Económica y Globalización (Bogotá: Centro Editorial Javeriano, 2003). Table 2. Cuban Merchandise Exports and Imports, by Major Category, 2001–2006 (million pesos) 2001 2002 2003 2004 2005 2006 Total Exports 1622 1422 1672 2188 1995 2759 Sugar industry products 55 448 289 272 149 219 Mining products 465 432 620 1068 994 1335 Tobacco industry products 217 144 215 217 225 238 Fisheries products 81 99 65 89 72 64 Agricultural products 31 26 42 33 16 16 Other products 279 273 441 510 583 888 Total Imports 4793 4141 4613 5562 7533 9420 Consumer goods 1079 1036 1159 1360 1670 2125 Intermediate products 3034 2544 2868 3465 4617 5416 Capital goods 680 561 586 737 1246 1879 Source: Oficina Nacional de Estadísticas, Anuario Estadístico de Cuba 2006 (La Habana, 2007). 9. José Alvarez and Jorge Pérez-López, “The Restructuring of Cuba’s Sugar Agroindustry,” in Pérez-López and Alvarez, editors, Reinventing the Cuban Sugar Agroindusry (Lanham, Maryland: Lexington Books, 2005). 10. Fidel Castro is reported to have said: “Ahora subió un poquito el precio del azúcar, pero sé que de eso no va a volver a vivir jamás este país. Eso es de la época de la esclavitud y de un pueblo lleno de semianalfabetos, un 30 por ciento de analfabetos totales y desempleados que hacían el trabajo animal…” See, “Fidel Castro dio por terminada la era del azúcar en Cuba,” Clarín (March 19, 2005), http://www.clarin. com/diario/2005/03/19/elmundo/i-03101.htm. 11. U.S. Geological Survey. Minerals Yearbook 2006 (Washington: U.S. Government Printing Office). 12. See Sergio Díaz-Briquets and Jorge Pérez-López, Conquering Nature: The Environmental Legacy of Socialism in Cuba (Pittsburgh: University of Pittsburgh Press, 2000), pp. 177–183. 13. On Cuba’s energy relations with Venezuela see Jorge R. Piñón, “Cuba’s Energy Crisis, Part I,” Focus on Cuba, Issue 67 (August 15, 2005), and “Cuba’s Energy Crisis, Part II,” Focus on Cuba, Issue 68 (September 26, 2005). 14. “Buenas noticias para finalizar el año,” Granma (December 25, 2004). 16. Comisión Económica para América Latina y el Caribe (CEPAL), Cuba: Evolución Económica Durante 2006 y Perspectivas para 2007 (November 2007) and earlier issues. 17. World Trade Organization, Trade Profiles 2007 (Geneva: World Trade Organization, 2007). 18. Miriam Malagón Goyri, “El Comercio Internacional de Servicios: Algunas Consideraciones sobre el Sector en la Economía Cubana,” in Eduardo Cuenca García, editor, Enfoque Sobre la Reciente Economía Cubana (Madid: Agualarga Editores, 1999). 19. E.g., Peter Maybarduk, “A People’s Health System,” Multinational Monitor (October 2004); Claudia Jardim, “Prevention and Solidarity,” Monthly Review (January 2005). 20. “Both Cuba and Venezuela reap benefits from medical program,” The Miami Herald (January 10, 2007). 21. Jorge F. Pérez-López, “Cuba 2005: The ‘Alice in Wonderland’ Economy,” FOCAL Point (January-February 2006).